The poems of Waldo Williams are full of eternal hope of a better world. 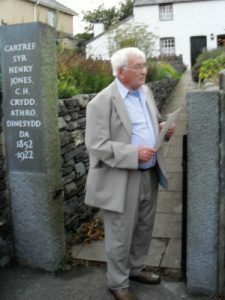 That was the gist of National bard, Ieuan Wyn’s lecture as he delivered the seventh Annual Cymdeithas Waldo Lecture at Llangernyw, near Llanrwst, on the actual date of Waldo’s birthday – September 30. 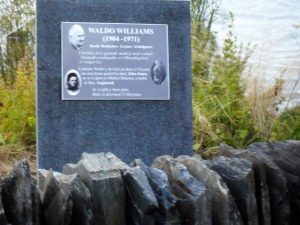 Though mainly associated with Pembrokeshire, Waldo also had close family ties with Bro Hiraethog as his mother’s family hailed from the area. Hence a plaque underlining the close association was unveiled at the entrance to the Sir Henry Jones Museum in the village. Sir Henry was Angharad Williams’ uncle. 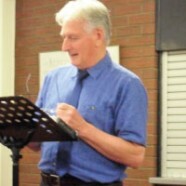 David Williams, Waldo’s nephew, as he carried out the unveiling, related some of the anecdotes that have survived about the family raised in the small cottage. Waldo was drawn by his roots, and along with his further close family affinity with the Black Mountains in Carmarthenshire, he felt a strong feeling of belonging to the whole of Wales. That is the essence of the poem ‘Cymru’n Un’. order to explain the nature of Waldo’s ‘hope’. It is not optimism which is the belief that matters will get better of themselves that Waldo had in mind but a belief that hope can be nurtured in order to execute changes. Hope was a functional virtue in Waldo’s poetry and in his whole way of life according to Ieuan Wyn. He referred to the constant use of verbs in the future tense peppered throughout his poems thus introducing a prophetic tone and all because Waldo had seen ‘order in his far away kingdom’. And the constant use of the image of a house as a home full of joy for the brotherhood of man was proof of Waldo’s eternal hope no matter what might be the deplorable state of the world at times. 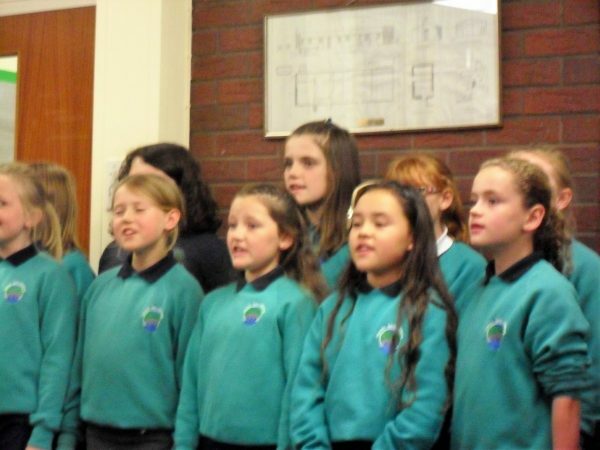 Prior to the lecture, pupils of Ysgol Bro Cernyw sang ‘Byd yr Aderyn Bach’, a poem for children penned by Waldo highlighting the freedom and innocence enjoyed by the birds of the hedgerows. The evergreen Tecwyn Ifan brought the evening to a conclusion by singing those songs of his influenced by Waldo’s poems. He sang the classic ‘Y Dref Wen’ as a finale. The bronze bust of Waldo made by sculptor, John Meirion Morris, stood in the corner and often blushed during the course of the evening as he heard the showers of complements. The sculpture had been on display at the Sir Henry Jones Museum for a while.